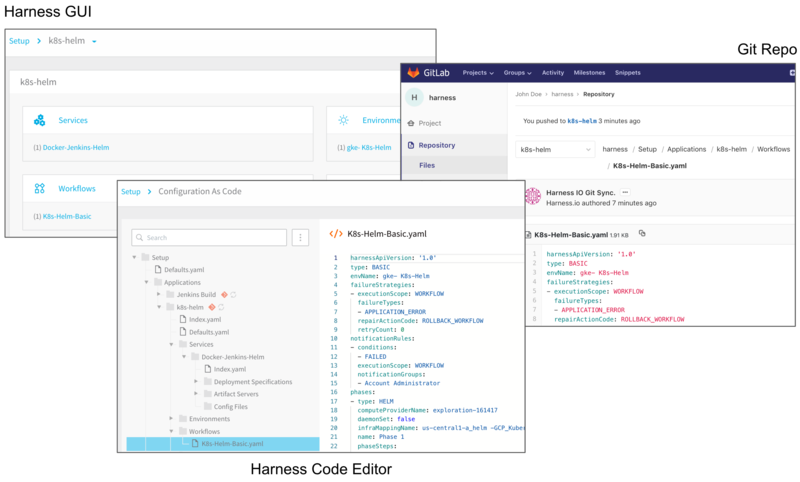 Using the Harness code editor, you can set up and manage accounts for artifact servers, cloud providers, and verification providers. You can edit application services, environments, workflows, etc, all in YAML. 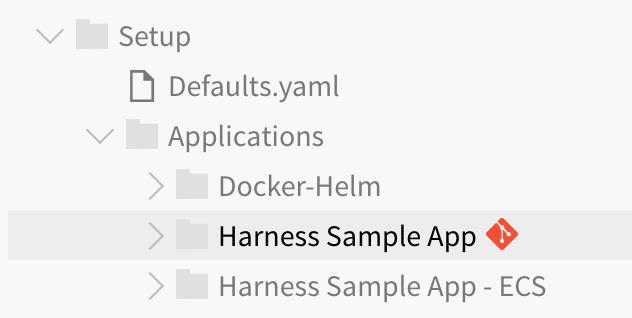 You can sync your Git repo with Harness to simply use YAML files in your source repo to make changes to Harness. Here is the same Harness workflow in the Harness GUI, Harness Code Editor, and a Git repo. Connect your Git provider to Harness using the steps in Add SourceRepo Providers. Trigger Harness workflow and pipeline execution from Git using Harness Triggers. See Manual Triggers and Github Webhooks and File-based Repo Triggers. There is no Trigger YAML for Harness Application. Triggers are omitted from YAML for security purposes. If your Application is synched with a Git repo and Triggers were synched as YAML, then it would be possible for someone to create a Trigger from Git and attempt to deploy your Harness Application. Click Configuration As Code. The code editor is displayed. Edit any YAML file to make your changes and click Save. The following tables provides an overview of the sync scenarios and how to configure them. Sync one-way (unidirectionally) from Harness to your Git repo. Set up a SourceRepo Provider with your repo and do not enable the Generate Webhook URL option or apply the Webhook to the Git repo. Select this SourceRepo Provider for all applications that you want to sync unidirectionally. Sync two-way (bidirectionally) between Harness and your Git repo. Set up a SourceRepo Provider with your repo and apply the Webhook created by the Generate Webhook URL option to the Git repo. Select this SourceRepo Provider for all applications that you want to sync bidirectionally. Stop synching an application with a Git repo, but keep the SourceRepo Provider connected for future syncs. In the Git Sync setting for the application, turn off the Enable/Disable setting. Later, when you want to start syncing again, turn on the Enable/Disable setting. Stop using a SourceRepo provider with an application. In the Git Sync setting for the application, click DELINK. Have the SourceRepo Provider sync bidirectionally with the Git repo, but have an application using that SourceRepo Provider only sync unidirectionally. You can sync your Harness account with a Git repo. You can sync the Harness account information with one repo and then sync one or more Applications separately with other repos or branches. Before Harness syncs with your Git repo it will confirm that all Harness' settings are in a valid state. If a connection is not working, such as a connection to an Artifact Server or Cloud Provider, Harness will not sync with your Git repo. Add your Git repo as a SourceRepo Provider in Harness. For more information, see Add SourceRepo Providers. Click Configuration As Code. The Configuration As Code page appears. 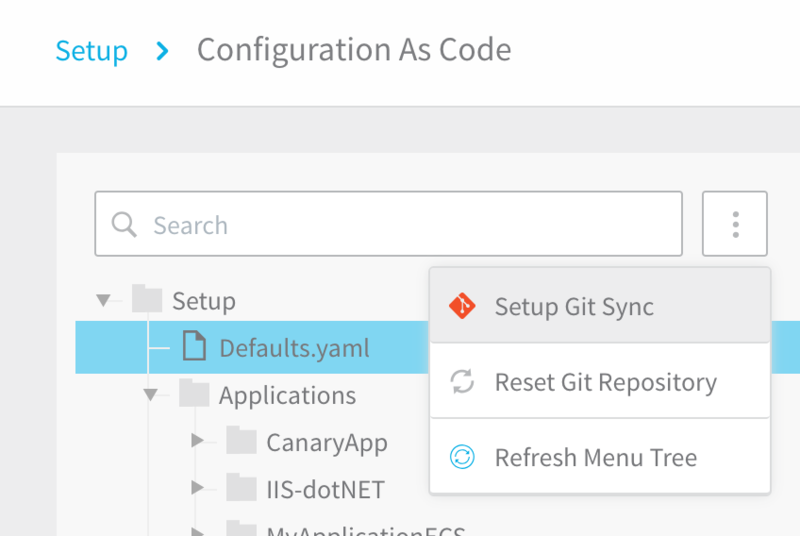 Click the ellipsis next to the Search field, and then click Setup Git Sync. 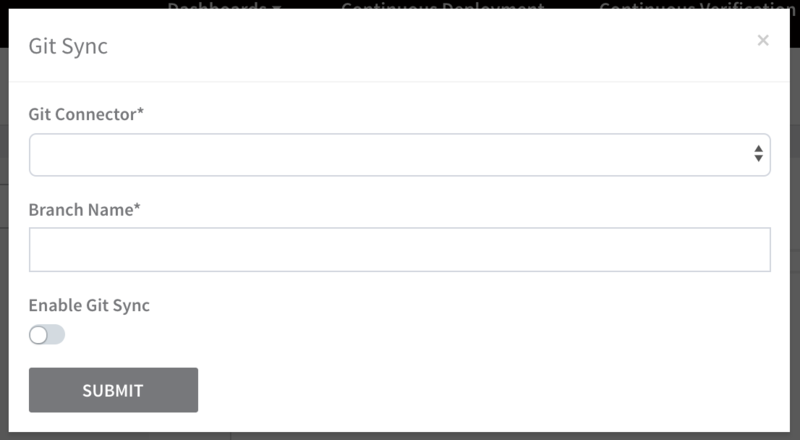 The drop-down applies to Account-level synch only. Applications are synced using the sync button next to their folder. The Git Sync dialog appears. In Git Connector, select a Harness SourceRepo Provider. For information on setting up a SourceRepo Provider, see Add SourceRepo Providers. In Branch Name, enter the name of the repo branch to sync with the Harness account. This might be the master branch, or another branch where you want to keep the Harness account-level settings. To enable sync between Harness and the repo in the SourceRepo provider, ensure Enable Git Sync is enabled. For more information, see Add SourceRepo Providers. Your Harness account is now synced with your Git repo. Open your Git repo to see the Harness account. When you select the Enable Git Sync option and apply the generated Webhook to your repo (as described in Add SourceRepo Providers), any changes you make in your repo are pushed to Harness. 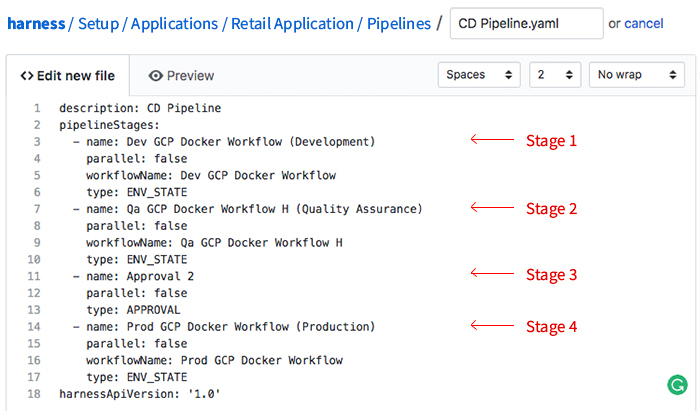 Below is an example of a CD pipeline.yaml file within the folder harness/Setup/Applications/RetailApplication/Pipelines. The file contains a pipeline with four deployment stages: Dev, QA, Approval, and Prod. The same config-as-code can be done for creating new services, environments, workflows, and everything else in the Harness platform. 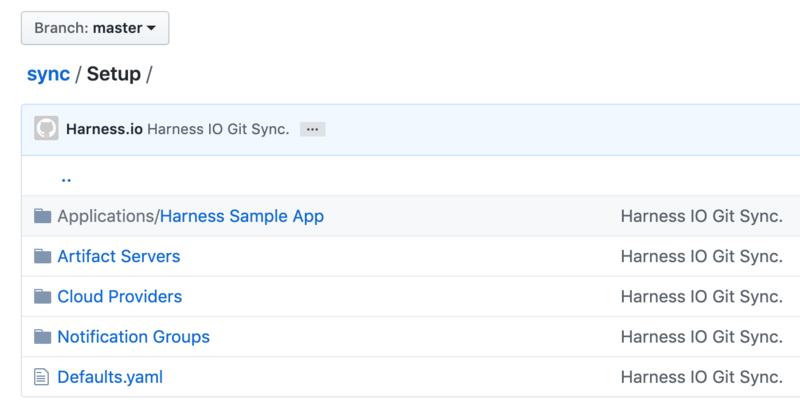 Whether or not you sync your Harness account with your Git repo, you can sync any Harness Application with your repo by itself. 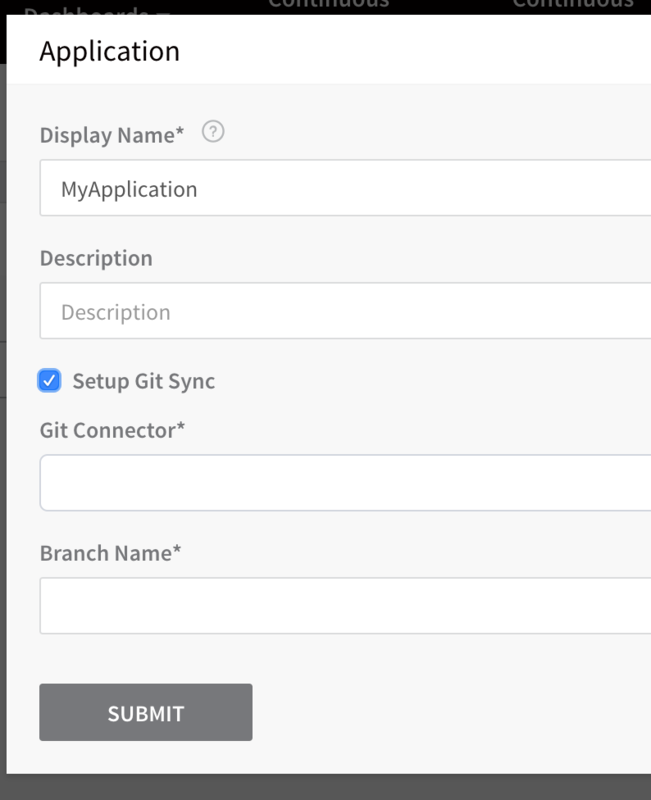 Harness Applications are set up and managed with Git separately from the Account-level sync. Syncing an existing Application - This method is explained below. Hover your cursor over the name of the application you want to sync. A Git Sync icon appears. 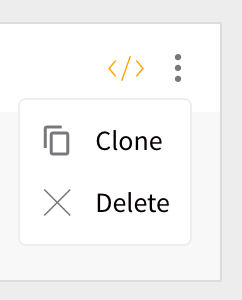 Click the Git Sync icon. The Git Sync dialog appears. In Branch Name, enter the name of the repo branch to sync with the Harness application. Click SUBMIT. The Git Sync icon is next to the application. To refresh a sync, click the Refresh icon. Look in your Git repo, and you will see the Harness application added. You can remove the Git sync connection between a Harness account and/or application by delinking the connection. Select the Git Sync connection you want to delink. For an account-level connection, click the ellipsis next to the search field, and then click Setup Git Sync. For an application-level connection, hover over the application's Git Sync icon, and then click the icon. In the Git Sync dialog, click DELINK. Click CONFIRM to confirm the removal of the Git sync. One of the advantages with Harness Git integration is the ability to clone or duplicate a Harness application entity quickly in the Git repo, and then have the cloned entity show up in the Harness platform. For example, you can clone a Harness environment in the Harness GUI using the Clone button. But if you wish to make several copies, this can be time-consuming in the GUI. With Harness GitOps, you can simply duplicate the environment folder in Git, give the duplicate folder a unique name, and push it to the origin. The new environment will appear in Harness.